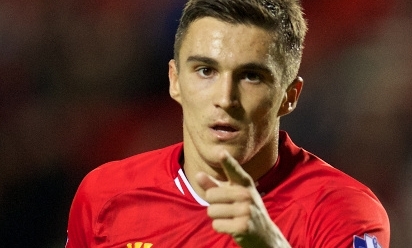 Liverpool U21s were in scintillating form as they hammered Tottenham 5-0 at Langtree Park on Monday night. Alex Inglethorpe's side were ruthless as five different scorers added their name to the score-sheet during an emphatic win. Adam Morgan netted the first from the spot before Cameron Brannagan side-footed home the second. Ryan McLaughlin tapped in Liverpool's third, Brad Smith curled a beauty for four and Joao Carlos Teixeira sealed the rout with a sumptuous chipped finish. The Reds controlled the game from the off; Brannagan probed in possession as Jordan Rossiter hounded the opposition in the middle of the park. Morgan saw two efforts go close early on - the first when he sped clear of Spurs' defence and shot wide of Jonathan Miles' post. However, the Halewood lad made amends on 25 minutes. McLaughlin hurtled down the left flank before being hacked to the floor in the penalty area and Morgan stepped up to bury the opener from 12 yards. Summer signing Aly Cissokho, playing his first minutes since sustaining an ankle injury in August, was included in Inglethorpe's side - and he carved the Reds' second goal with a sublime pass. Tottenham's back-line was suddenly in disarray and Brannagan exploited the gaps with a late run from deep. Cissokho spotted his burst, dinked the ball over the top and the youngster calmly tucked his shot below the 'keeper. Rossiter was on the ball seconds later and he pieced apart the Spurs defence with a 35-yard inch-perfect pass; however, McLaughlin saw his curling effort palmed clear. It was 3-0 before half-time when Smith, playing for the first time since January 14, danced down the right flank and squared the ball to McLaughlin, who prodded home Liverpool's third. The Reds picked up where they left off after the interval. Smith scooped the ball out on the right flank, cut inside and unleashed a sensational curling effort from the edge of the box that dipped under the crossbar for 4-0. Smith was then replaced by Samed Yesil, who came in to play his first minutes since January 28 – and the forward went agonisingly close to crowning his return with a goal when he struck the post with a fine effort. Teixeira was the next substitution, and he took seconds to make his mark on the game when he pounced on a defensive mix-up, raced through on goal and dinked the ball over the onrushing 'keeper to seal a fantastic win for the young Reds. Liverpool U21s: Ward, Flannagan, Cissokho, Wisdom, Paez, Rossiter, Smith (Yesil), Roddan, Morgan, Brannagan (Teixeira), McLaughlin (Peterson).